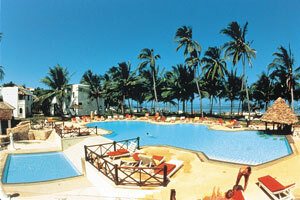 Styled to resemble a 13th century Swahili town complete with winding lanes, carved balconies, fountained courts and bustling market squares, the Mombasa Serena Beach Hotel provides an oasis of tranquillity whilst delivering a unique mix of high-action water sports, sybaritic sun worship, world-class cuisine and vibrant nightlife. Set back from the powder-white sands and shimmering waters of the Mombasa National Marine Park, Mombasa Serena Beach Hotel décor blends the time-honoured intricacy of Swahili carving with the jewelled glow of Arabian lanterns, the white-gleaming splendour of a Sultan’s palace and the lotus-cool of a Persian water garden. The extensive coconut-palm cooled grounds offer an exotic mix of tropical trees and bright blossoms and centre on an idyllic sky-blue swimming pool with a thatched ‘swim-up’ bar and crystal waters that cascade into the tiled coolness of the market square below. 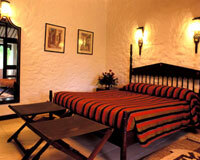 Each one of the rooms contained within the winding lanes and shady courts of the traditional Swahili Village is uniquely styled to resemble a historical building from the ancient island town of Lamu. Design features include carved balconies, coral pillars, fretwork screens, Zanzibari-carved doors, gleaming arches, stone-carved niches and lavish Lamu-styled furniture. Our selection of spacious garden rooms looks out over a lush green garden towards the sparkling reaches of the Indian Ocean. Design features include carved balconies, winding stairways, broad verandas, sumptuous brass-inlaid furniture and a colour scheme that fuses aquamarine seas, azure skies and emerald palms. Cooled by a gentle ocean breeze and clustered around the hanging blossoms of a traditional Persian garden this sumptuous table d’hôte restaurant features Swahili carvings, stained glass lanterns, Lamu-esque arches, marble fountains and wide verandas commanding views over waving palms and shimmering ocean. The cuisine, which features internationally themed menus and lavish buffets, also draws on a strong Swahili influence to introduce an abundance of tropical fruits, exotic spices, coconuts, limes, coriander and fresh-caught seafood to the colourful choice of dishes. Under the shade of a palm-thatched roof, looking out over the sapphire waters of the pool is Coconut Willy’s Pool Bar, a ‘swim-up’ bar that allows guests to enjoy a cooling drink, without having to get out of the pool. 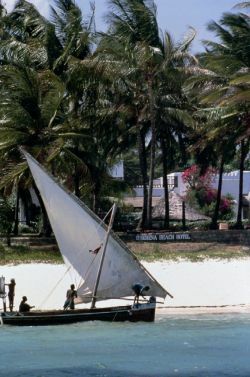 Drawn up on the shoreline, just yards away from the breaking waves, and built to resemble a traditional Swahili dhow - complete with sanded decks, painted prow, roped capstans, lashed sails and kanga-decked tables, the Jahazi Grill specialises in stunning extravaganzas of fresh-caught seafood. Choices include: crab, squid, lobster, prawns and a wide variety of sea fish. Vegetarian and non-fish options are also available. The bustling Sokoni plaza is designed to resemble the colourful marketplace of a traditional Swahili town and features an ornamental fishpond, fluttering Arabian sunshades and a palm-thatched dining area offering fresh-baked pizzas and a wide range of international snacks. 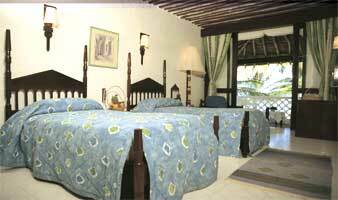 The breeze wafted Nyota terrace offers a rare glimpse into the traditional Swahili world. A world where veiled maidens sit behind fretwork screens, brass lanterns swing in carved niches, visitors recline on sumptuous sofas and families sip cardamom-flavoured coffee and look down from carved balconies on to the bustle of the square below. The internationally designed piano bar features live piano music, a sophisticated cocktail line up and generous open-air terraces where guests may recline on cushioned benches as they trace the path of the moon across the ocean. Centre stage to the bustle of the market place is the cool of the ice cream parlour offering everything from lavish knickerbockers glories to luscious fruit concoctions. Set amongst rolling lawns, the thatched Makuti bar offers teas coffees and freshly squeezed juices and hosts the colourful Lamu Market where a wide range of traditional music, cultural displays, local handicrafts and tempting Swahili snacks are on offer. 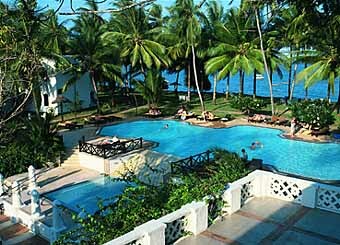 Mombasa Serena Beach Hotel has been designed to offer a fascinating glimpse into the rich heritage of the ancient Swahili culture and features informative displays of bright-woven kangas, beaded gourds, intricate basketwork, polished brass and bejewelled ceremonial artefacts. - Barber and hair salon. - A wide range of board games. 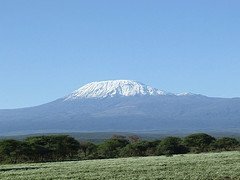 © Copyright 2005 - 2008 © Mount Kenya Climbing Expeditions. All Rights Reserved.